As The Feminine Gift grows and changes, we will be welcoming new writers to our little community. The following is a post written by Alexa. 1. He is the ideal husband. Sorry Oscar Wilde for stealing your line, but St. Joseph is the ideal husband. St. Joseph is the standard that you should look to when thinking of qualities you want in a future husband, or qualities you would like to aid your husband in attaining. Some of the amazing qualities of St. Joseph are that he is a man of integrity, chastity, and fortitude. He is a man who trusts in God, even when the situation seems impossible. He is man who respects women! No other man, other than Christ, has shown such a deep and profound respect for women. St. Joseph protected, supported and sacrificed day after day for Mary. That is true love. That is the kind of man you want by your side. That is the kind of man you have to strive in virtue to be worthy of. Because it goes both ways. You're not going to get a St-Joseph-type man, if you are not willing to strive to be a Mary-type of woman. 2. He is a great father. Now I am not a married woman, but as I get older and the more I look at the qualities of the men I find attractive, the question that goes through my mind over and over again is “will he be a good father?” This is a question woman should ask themselves when looking for a future spouse. You may find a man who can pull off mustard-yellow pants, who dances like Fred Astaire, and has the charm of Cary Grant, but would he make a great father? When you marry a man you are not the only one affected by your decision. If you settled for a man who you think is not that wonderful just so you can have a ring on your finger, chances are he won’t be that great of a father, and your future children will pay the price. 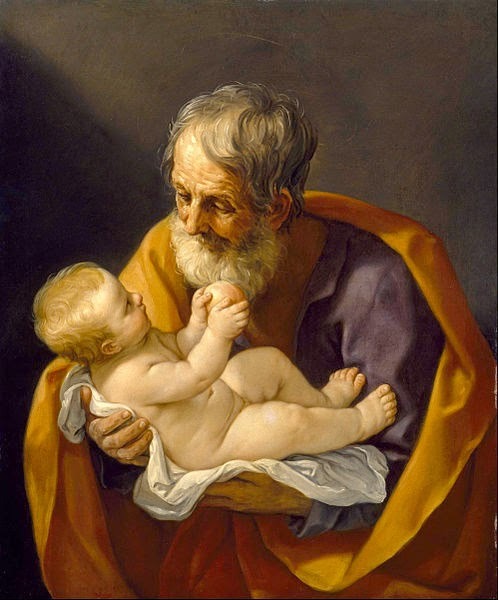 St. Joseph shows what sort of role model a father should be. He is the kind of man that gives a good example to boys of what it really means to be a man, and shows girls that they are a treasure beyond compare, regardless of their size, beauty or intelligence. Because St. Joseph puts Christ first, he worked all his life to support Mary and Jesus. He protected them from evil and harm, he sought out the missing child Jesus, without rest, with Mary by his side. These are the qualities you want to see in the man who is trying to win your heart, or in the man who has already won your heart. It is hard in today's age to be a good father, so help a brother out and pray to St. Joseph for your future - or present - husband right now. 3. He is the protector of virgins. Whether you are a virgin or a born again virgin, St. Joseph has got your back. I have first hand experience of St. Joseph's protection. As a single woman, often I find myself having to do things that married women take for granted, because their husbands do it for them. Such things as fixing my car, bathroom drawers, unclogging sinks, killing bugs and the list goes on. Many a prayer has gone up to St. Joseph as I screamed at the shoddy drawers in my apartment that were falling apart as I tried to screw them back together. Or when I could not get the hood of my car open and I was freaking out because I really, really needed to put in washer fluid. I said a prayer to St. Joe and out of nowhere a nice young man came and asked if I needed help and proceeded to open up my hood for me! So let me assure you, if you need help as a young or young-at-heart single woman, look no further. St. Joseph has got your back. He will also help you live a chaste life, because if anyone knows how hard it is to live a chaste life I think it would be the man who had to live a chaste life married to the most beautiful and perfect woman ever to grace the earth. 4. He is the model worker. Whatever work you do, be it a student, mother, or a 9-to-5 office job, St. Joe is the man to look to. I know I am still learning what it means to work well, to take advantage of all the annoying daily occurrences in life. It may be putting up with a professor who is crazy, a child that misbehaves, or a coworker that won’t stop complaining to you about everything wrong in their lives. Whatever it is, St. Joseph shows us the path we need to follow in order to be a good worker. That means doing our best in the smallest tasks, every day. Because nothing was beneath this great man - he was a humble carpenter - he saw his work as his means of salvation. Whatever vocation we are called to do, we will have to work. Whether we are mothers, career women or religious sisters we will be working so we better learn how to do a job well, and St. Joseph is the man to show us how. 5. He shows that a hidden life is just as valuable as a visible one. What do I mean by this? Women often lead lives where we do many different tasks that are small yet, they are the essential fabric of life. Women tend to lead hidden lives. We do a million jobs and yet seem to receive little accolades. I have many married friends who have now become mothers and if I have heard one complaint over and over it’s that the role of a stay-at-home mother seems to be taken for granted. I agree with my friends: society no longer values the role of stay-at-home mothers. On the other hand, this society's values are ridiculous, so why do we care? Unfortunately we do. We still seem to care what society thinks. We want to be seen, we want applause when we change a diaper or fax a document because darn it, I am doing a lot of little tasks well! And these little tasks are vital to the running of a household or a business, yet no one is taking any notice! It may seem unfair and we can rant and rave feminist propaganda if we want, but it would be more worthwhile to see that a hidden life is a better life. St. Joseph led a hidden and silent life and look where he is now. He did not perform great actions, no heroic tasks but rather he did so many vital small tasks with great love and courage. He agreed to marry a Jewish girl who was already pregnant. He walked across a desert with said Jewish girl and her son to keep them safe. He worked all his life taking care of a child that was not his. He seemed to have done nothing grand and he said nothing worth writing about. Yet, he has become the standard of what it means to be a man and the standard a woman should look for in a man. His hidden life allowed Christ to do the greatest deed in the history of the world. So if you have never taken notice of St. Joseph before, you may want to send up a prayer to this man. I assure you he will hear you and take care of you. Alexa is passionate about living her Catholic faith and fascinated by her femininity. "I have always been enthralled by the classic women of old like St. Therese, Katherine of Aragon, Edith Stein, to Grace Kelly, Audrey Hepburn and Rita Hayworth. I never liked the ideas of many radical feminists. I never saw the home as a prison for a woman, rather it was her canvas for creativity, where she was queen; free to rule with a gentle and kind heart. Saints like Joan of Arc and St. Theresa of the Cross showed the valour and strength of a woman yet they never rejected their femininity. Rather they showed that their strength, dignity , and gifts came from their femininity and to deny their feminine gifts was a disservice to their personhood. My thesis for my undergrad was all about what it means to be a woman of God and why God made women and men different. Other than an interest in femininity, I am working towards becoming a glamourous administrative assistant ;) I enjoy old movies, opera, good books, lots of coffee, and a good glass of wine. I also strive to live up to the title of Awesome Aunt to my five nieces and nephews." Can I add that St. Joe did his best work while sleeping? Three times an angel spoke to him while asleep! This is sure to make us, who might fall asleep during prayer, feel that much better. Yeah! I've never made the connection but it's true. St. Joseph had some of the work done for him, and all he had to do was go to sleep. Of course, he had to wake up and get to work...but hey.